Who doesn’t love getting all-natural, homemade gifts made with all the healing benefits essential oils offer? 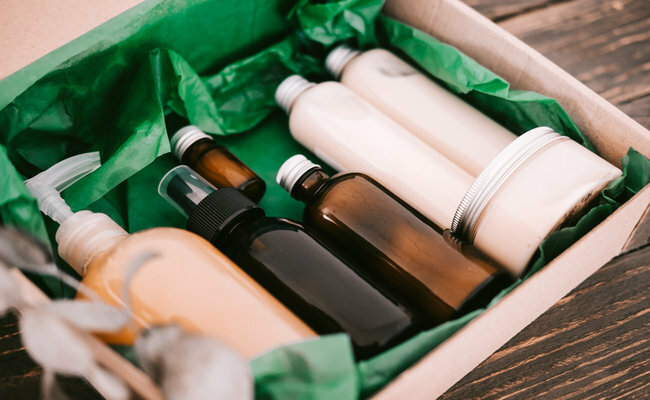 Aromatherapy gifts are not only more personal but also more affordable for the gift-giver on a budget. So, gather your oils and a few other supplies to make some of these delightful essential oil gifts for your friends, family members or coworkers. This luxurious moisturizer helps soothe skin, reduce blemishes and minimize the appearance of wrinkles. Unlike most of the anti-aging creams on the market, this one does not contain petrochemical-based products or chemical preservatives, making it a real treat for your skin. And, frankincense is one of the most healing essential oils for the skin. Keep in mind that because it is free of preservatives it doesn’t last as long as chemical-laced commercial products, so you’ll want to use it within a month or keep it for up to three months in the refrigerator. You may want to use an old blender for this recipe, as the beeswax can leave a film that is difficult to completely remove. 1. In a small saucepan over low heat, stir almond, apricot or coconut oil and beeswax together just until beeswax dissolves. Do not allow oil to become hot. Immediately remove saucepan from heat and add frankincense essential oil. 2. Pour water into blender, cover and begin blending it on high speed. With blender running, slowly pour the beeswax-oil mixture through the hole in the blender lid. The mixture will begin to thicken after about three-quarters of the beeswax has been incorporated. 3. Once all the beeswax has been blended, immediately pour cream into a 16-ounce glass jar or two 8-ounce glass jars. Use a spatula to remove any remaining cream from blender. Makes approximately 1¾ cups. This tea tree-infused ointment helps to soothe and disinfect cuts, scrapes and other wounds. It lasts up to a year. You may want to use an old blender for this recipe, as the beeswax can leave a film that is difficult to completely remove. 1. In a small saucepan over low heat, stir the olive oil and beeswax together just until the beeswax dissolves. Do not allow oil to become hot. Immediately remove saucepan from heat and add tea tree essential oil. 2. Immediately pour salve into a 4 to 6-ounce glass jar. Use a spatula to remove any remaining cream from blender. Makes approximately 1/2 cup. This silky cream soothes inflammation as it glides across the skin. It is simple to make and doesn’t require a lot of ingredients. Because there are no chemical preservatives used, it is a good idea to store this cream in the refrigerator. You will need a medium-sized wide-mouthed glass jar or a few small glass jars for storing the lotion. 1. Boil water and pour over chamomile flowers. Cover and let brew for 10 to 20 minutes. Strain out flowers, reserving herbal infusion. 2. Pour oil into a heat-safe glass measuring cup and add shaved beeswax. Set it in a saucepan of water that reaches about halfway up the side of the measuring cup. Heat on stovetop over low heat until beeswax dissolves. 3. Immediately after beeswax melts, remove pot from stove. Allow to cool for a minute or two but not longer as beeswax will begin to harden. 4. Pour the chamomile infusion (tea) into a blender and blend on high speed with the lid on (with a hole left in lid for pouring beeswax-oil mixture). Slowly pour oil-beeswax mixture into the chamomile tea. It will begin to emulsify as you continue pouring oil. It normally begins to thicken after about three-quarters of the oil has been incorporated. Continue adding oil until you’ve incorporated all of it. 5. Immediately, pour lotion into glass storage jars. Use a spatula to remove any remaining lotion from blender. 6. This lotion lasts about 3 months and is best kept in the fridge. One of the best ways to appreciate the invigorating scent of lemon essential oil is to incorporate it into your body lotion or, better yet, make your own lemon body lotion. Additionally, this is a great lotion to apply before heading outdoors to help keep mosquitoes at bay. 1. Pour oil into a small saucepan and heat over low to medium heat until beeswax dissolves. Remove from heat immediately. Allow to cool for 1 to 2 minutes. Add lemon essential oil. 2. Pour water into blender and begin blending on high speed with the lid on (with a hole left in the lid for pouring the beeswax-oil mixture). Slowly pour oil-beeswax mixture into water. It will begin to emulsify as you continue pouring the oil. 3. Pour lotion into glass jars. The lotion lasts for about 6 months and is best kept at cool temperatures to prolong shelf life. You can also store it in the fridge if you choose. Makes about 2 cups.